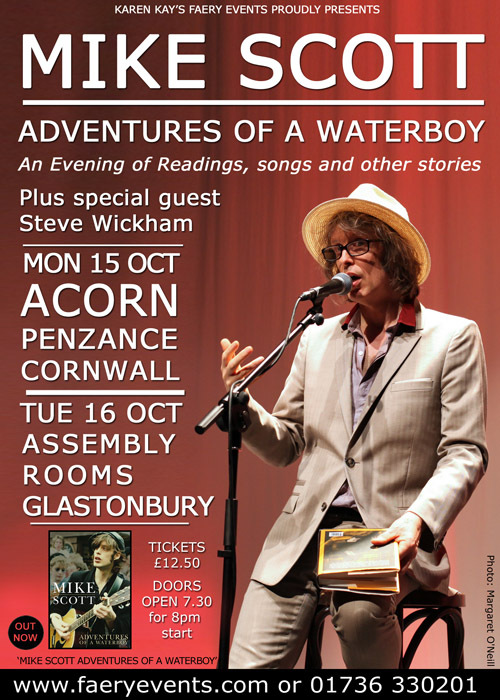 The Waterboys’ frontman marks the launch of his memoir Adventure Of A Waterboy with an intimate reading from the book followed by a short acoustic set with his colleague, fiddler Steve Wickham. The Waterboys are best known for classic songs like The Whole Of The Moon and ground-breaking albums including This Is The Sea and Fisherman’s Blues. Their most recent work, An Appointment With Mr Yeats, sees Scott and his compatriots setting the lyrics of Ireland’s master poet to melody against a background of rousing rock’n’roll. Mike’s devastatingly honest and beautifully crafted memoir describes the adventures of a rock’n’roll seeker in quest of musical frontiers; it is serious, funny, profound, whimsical, revealing and enigmatic. Following his path through teenage punk bands, the success of The Waterboys and subsequent experiences in New York, Scotland’s Findhorn community and beyond, Adventures Of A Waterboy doesn’t so much unravel the myths surrounding Scott and The Waterboys; it blows them to smithereens.